This is the largest Division of South Central Railway extending over four states Telangana, Andhra Pradesh, Karnataka and Maharashtra. 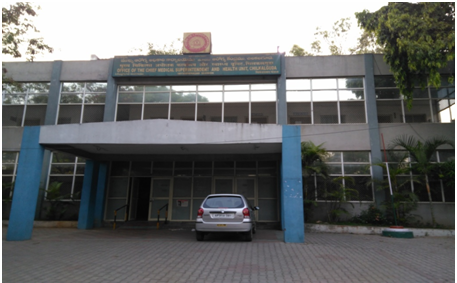 The administrative Head is Chief Medical Superintendent, whose office is located above Chilakalaguda health unit, Secunderabad. It caters to 22267 employees and 5390 retired employees. Curative Services: There are ten Health units spread across the whole division providing primary care. They are equipped to provide OPD care and resuscitation measures for critically ill.Secondary and Tertiary care is provided by Central Hospital, Lallaguda and there is no Divisional Hospital. Tie up is available with private hospitals to provide tertiary care. Public: First aid is rendered to needy train passengers. Preventive and promotive care: immunisation, maternal care and family welfare services are available. Health education meetings and health camps are regularly conducted. Public Health: Colony sanitation and certain stations sanitation is maintained by outsourcing and departmental staff. Drinking Water and Quality of food is regularly monitored through examination of vendors, inspection of stalls, kitchens and collection of samples for analysis. Industrial health: All cases under Workmen’s Compensation Act are dealt with immediately. First aid lectures, maintenance of first aid boxes is done. Workplace inspections are done and safety precautions observed. PeriodicalMedical Examination: Kazipet: A – 2 and below categories. Chilkalguda: all categories. Disaster Management: There are 10 Portable medical kits for accidents, 4 Scale II and 2 Scale I Accident Relief Medical Equipment at different locations. Static First Aid Boxes are available at all stations, passenger train guards, other offices. All Engineering gangs are provided with first aid boxes. •Primary Care through out patient service. •Investigations through tie up with local diagnostic agencies. •Cash imprest for emergency medicine purchase. •Emergencies attended round the clock. Observation beds for recuperation and stabilization. •Medical Officer, Pharmacist, Sister, Dresser, Hospital Attendant and Safaiwala are the staff. •Glucometer, ECG machine, Nebuliser, Oxygen, Suction machine are available. 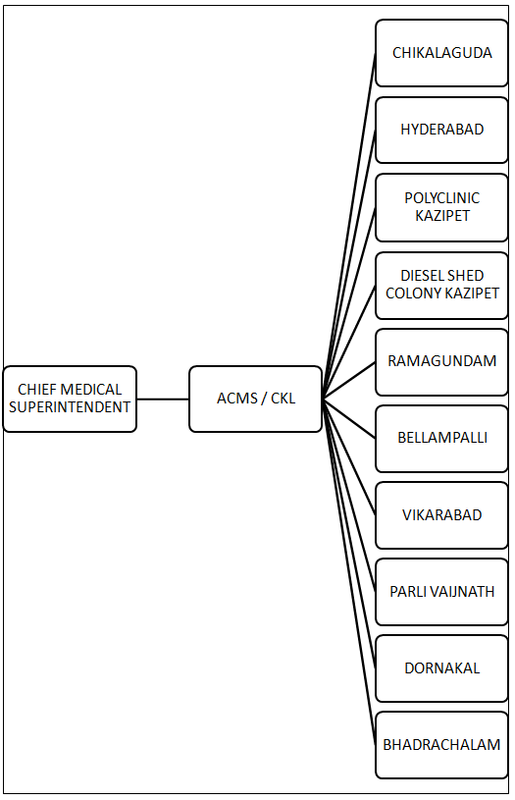 •KAZIPET: Ambulance, Laboratory, X-ray and USG available. IN EMERGENCY: The beneficiary is advised to contact their Authorised Medical attendant. If you are in a different place needing emergency medical aid, contact nearest Railway doctor. He or AMA will make necessary arrangements. Avoid going to tie up hospitals directly. In unavoidable circumstances inform AMA immediately. Take proper referral letter. If taken treatment in a private hospital in emergency, submit claim within six months. Remember the reimbursed amount will be at CGHS tariff. Apply to CMS. Format enclosed. Rohini Hospital, Hanumakonda for all general cases.Till 08.11.2017. Prithvi Hospital, Hanumakonda for cardiac cases. Till 17.01.2018. Jaya hospital, Hanumakonda for all general cases. Till 11.3.2018. Singareni Collieries Limited Area Hospital, Kottagudem for emergencies. 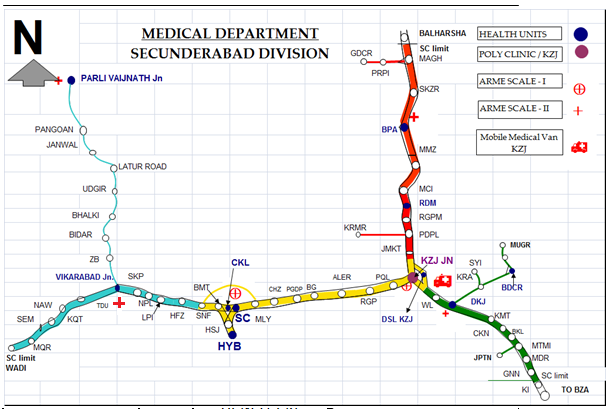 •B Stations: VKB, PRLI, RDM & BDCR under medical department. Only PRLI & VKB outsourced. •D Stations: DKJ & BPA departmentally managed. 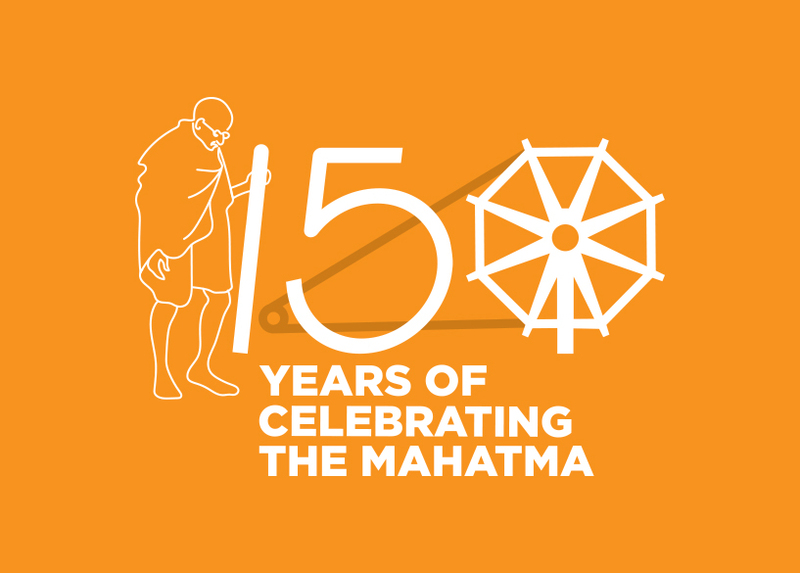 •Nampally & PRLI colonies sanitation and anti-malarial work is departmentally managed. •VKB, KZJ, RDM, BPA, DKJ & BDCR Colonies sanitation and anti-malarial work is outsourced. If yes, have you received any amount from Insurance company for the treatment in question. Give details in a separate sheet of paper. *In case the beneficiary has medical insurance policy and intends to claim for treatment in question, then he / she may make claim to insurance company first and then submit claim to railways with documents, bills etc. attested by insurance company. Original cash vouchers of drugs / consumables / implants etc. Outer pouch of stent, pacemaker, implant etc. I hereby declare that the statements in this application are true to the best of my knowledge and belief and that the person for whom medical expenses were incurred is wholly dependent upon me. I am aware that misuse of medical facilities or misrepresentation of any kind can attract penal action including cancellation of MIC / RELHS card. I hereby declare that this is my final claim and I shall not make any claim in future to Railway or any other health scheme in respect of this treatment episode. Has been under my treatment for _______________________________________________________ disease from _______________ to _______________ at the _________________________________ hospital and that the treatment as described in the attached Discharge Card No. __________________ and attached bills there on were provided due to an emergency situation, treatment for which could not be delayed, I further certify that the treatment provided was essentially required.